Home » » Land Grab At Panama? 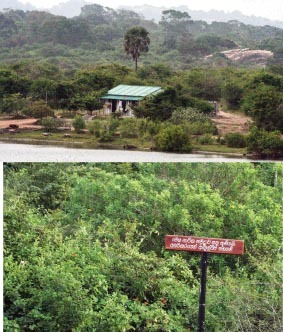 However though sanctions have been imposed by the Forest Department, Archaeological Department, Coast Conservation Department and Central Environmental Authority on carrying out any development work on forestlands, the Sri Lanka Navy claims that such formalities are totally discarded when the Defence Ministry approves their projects. Speaking on the construction work carried out by the Navy in Panama in the Ampara District, Navy Spokesman Commander Kosala Warnakulasuriya said that they have not followed any of these procedures nor would they require permission from the said institutions as the construction is being carried out on Defence Ministry land. “This is a Defence Ministry land and there is no necessity to obtain approval from any department to carry out any of our development work,” claimed Warnakulasuriya. Of the total number of lands, over 1000 acres are forestlands that come under the control of the Forest Conservation Department. The villagers on the other hand have a different story to tell. “These are our native lands. Some of us have deeds and the rest of us have licenses,” said Somasiri one of the villagers who alleges he had to vacate his land. For the villagers losing their occupational lands and the dwellings therein, have pushed them from pillar to post. According to the villagers, no sooner the war was over the Pottuvil Police had allegedly evicted the villagers from their properties claiming that the government wants to construct a hotel project along the coastal belt. “Even though they continued to demand that we move away from our native lands we did not heed the instructions of the Pottuvil Police. The then OIC of the Pottuvil Police once threatened us and said that we would not be allowed to stay on our lands for much longer. When we protested against the Police demand I was asked to come to the Police Station and threatened,” said Somasiri. Meanwhile, the Chief Incumbent of the Panama Temple, Ven. Panama Sri Chandrarathana Thero said it is clear as to who chased away the villagers on that fateful night leaving all the families homeless and depriving them of their livelihoods. “The sole income of these villagers was either from chena cultivation or fishing. After being chased away from their villages, the people are now homeless and with no source of income. No other party in this area has T-56 riffles. The day after these villagers were chased away, an Air Force detachment came and the entire area was cordoned off and other than the security personnel no other party was allowed to even approach,” said the Thero. According to the Thero, although complaints were lodged with the Pottuvil Police no action was taken to make any arrests in this regard. “It is almost three years now since the villagers were chased out; and the Pottuvil Police has been extremely lethargic towards making a breakthrough in the case. Even those who were engaged in fishing are not allowed to continue with their livelihood activities as the Navy has restricted the people going out to sea along that coastal stretch,” said the Thero. Meanwhile, Coordinator of the Movement for Land and Agricultural Reform (MONLAR) Lakpriya Nanayakkara said that although the Navy is claiming that they are constructing a camp, the pictures they have taken from afar shows that they are constructing a hotel complex. “The Lahugala Pradeshiya Sabha took legal action against the Air Force for doing illegal construction within the forest. When the case was first called on March 5, the Magistrate asked the Air Force what they were constructing in the forest and was told that it is an Air Force Base. Then the Magistrate wanted the Air Force to bring the Pradeshiya Sabha approvals for construction work. Although they promised to produce them at the next hearing scheduled for March 19, they failed to do so. At the third hearing Pradeshiya Sabha Lahugala obtained an injunction order against the Air Force construction work. Now the work has come to a standstill,” said Nanayakkara. Meanwhile, Director, Environment Conservation Trust Sajeewa Chamikara said neither the Navy nor the Air Force has carried out an Environmental Impact Assessment (EIA), although they have destroyed the forests that come under the purview of the Forest Department. However Deputy Director Archaeology Ampara W.H.A. Sumanadasa said that neither has the Navy obtained permission to carry out any development work on the archaeological sites nor has it requested any approvals. “How can the Archaeology Department expect the Sri Lanka Navy to obtain approval from us when it does not even allow archaeology officials to visit the sites? There are many archaeological ruins which are said to date back to the prehistoric era, within the Navy camp in Panama,” said Sumanadasa. According to Sumanadasa, all attempts taken by him to visit these archaeological sites in Panama on the directive of Director General Archaeology Dr. Senarath Dissanayake one and a half years ago failed, as the Navy did not allow anyone to even approach these sites. “Before the war began we had a circuit bungalow on this site in Panama. However after the war the bungalow was ransacked and only the walls were remaining. The walls too collapsed during the tsunami and the land was acquired by the Navy after the end of the war. Our Director General wanted me to get this land released and construct a circuit bungalow but how can I implement his directive when the Navy is not even allowing me to get closer to the land,” said Sumanadasa. Although Sumanadasa was not able to visit these archaeological sites, he says that people in the area have told him that the ruins date back to the prehistoric era and that there are many ruins found in all the places the Navy has taken over. “I have written to our Director General and I am awaiting his reply to take the next step,” said Sumanadasa. Meanwhile Navy Spokesman Commander Kosala Warnakulasuriya said that no one can be allowed inside the Navy camp as it is military land. “If the Archaeology Department officials want to pay a visit, permission has to be obtained from us. No one will be allowed to walk into our areas without permission. However with permission obtained through the proper channels, anyone can visit the camp area,” said Commander Warnakulasuriya. Air Force Spokesman Wing Commander Shiraz Jaldeen said that he is not aware of any court injunction to stop construction work. “We are in a small detachment and the Air Force is not doing any construction work. We are only guarding this particular area. It is the Presidential Secretariat that engages in construction work,” said the Wing Commander. When asked whether there is an injunction order taken by the Pradeshiya Sabha Lahugala against the construction work, Jaldeen said that he is unable to furnish further details as it is the Presidential Secretariat and not the Air Force that is involved in development work. “Can you please call the Presidential Secretariat and find out all these details. I am very sorry for not being able to give you any answers as I am not aware of these issues,” said the Air Force Spokesman. Divisional Secretary Lahugala A. Somarathana meanwhile said that all those who lost their lands would be given alternative lands at the earliest. “Out of all the families only one family had a license for his land and we have already settled him in a nearby village. The rest of the families did not approach us; maybe it is because they do not have any legal document to prove that they were living in this area. However we will not desert them, and will provide them with alternate lands in due course,” said the Divisional Secretary. When The Sunday Leader contacted the Director, Coast Conservation Department, to find out whether the Navy has obtained approval, Premaratne said that he has to check the files before making any comments. “Since we are receiving a number of applications every day and we are in the process of granting approvals, I cannot say off hand whether the Navy has sought approval or whether we have granted them the necessary approvals. Anyway we have to help the Forces as they are guarding us and for defence matters we cannot ask them to obtain our approval. I am going for a meeting at the Defence Ministry now so please call me next week if you need any more details,” said the Director. All attempts to contact Conservator General of Forests K.P. Ariyadasa for a comment failed.